Our RESOURCES and how they can help you. Our researchers and what they can do for you. Our PARTNERS at work for you. Bringing it all TOGETHER for you. OXFORD, Miss. – What started out as a high school class assignment turned into a career path for Jackson native Tia Holloway. The University of Mississippi student’s journey to pharmacy school took a different route than she originally planned, but Holloway is excited to reach her destination. As a freshman at McLaurin High School, Holloway took a career placement test that suggested she explore a career in pharmacy. She then began to research the field and developed a 10-year plan for entering the profession. Holloway had initially planned to start her pre-pharmacy studies at Ole Miss. However, an opportunity to stay close to her family and her church’s choir and youth development ministries in Jackson changed her plans, and she enrolled at Jackson State University. Holloway finished her pre-pharmacy degree at JSU in May 2018, after just three years. This fall, she entered her first professional year at the UM School of Pharmacy. “I wouldn’t have been content going to any other pharmacy school except Ole Miss,” Holloway said. “The school selects students who are the best in several areas, and it offers a variety of services specific to the advancement of each individual student. The School of Pharmacy and Jackson State are partnering to help other JSU students who want to pursue pharmacy with the Preferred Admissions Program. This program offers pre-admission to pharmacy school for JSU freshmen who excel in pre-pharmacy classes and demonstrate a passion for service activities. Holloway is helping fellow JSU Tigers interested in pharmacy by participating in a mentoring program that assists them with their applications to Ole Miss. 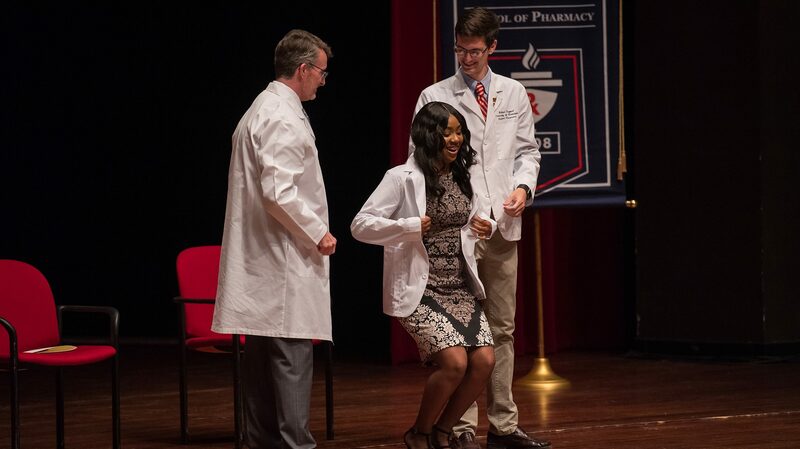 “My commitment to Ole Miss pharmacy began way before the Preferred Admissions Program, so hearing about this program upon my last year at Jackson State felt almost kismet,” Holloway said. Soon Holloway will be able to share her firsthand experience in everything Ole Miss offers. She said she’s excited to apply the knowledge and skills she learns in class to her Introductory Pharmacy Practice Experience and in her internship with Kroger Pharmacy.